When it comes to the myriad of lease agreement forms available to landlords, rules of interpretation are the common thread. Each state has its own quirks, and local rules may require special lease add-ons, which can make the leasing process confusing. That’s why hiring an attorney to review the content of the the lease is the best way to avoid problems down the road. But it’s also good to know some of the ground rules that will be applied if there is a lease dispute. Not only does that make that lease negotiation process more effective, but it can help landlords flag any potential problems that should be addressed by a lawyer — before it’s too late. RULE #1. The tenant must understand the provisions of the lease agreement in order to abide by it. If you can’t understand provisions, or don’t know what should be in your lease, the tenant won’t either. Because everyone builds from standard form leases — even lawyers — the question becomes what to keep in and what to take out. Using a checklist that is location-specific aids legal experts in creating finely-crafted documents. Without that precision guide, a landlord may struggle to strike the balance, and in the process, wind up a lease that is either too sparse, the laid-back “let’s keep it to one page” approach, or too onerous, the “throw in everything but the kitchen sink approach that risks including provisions illegal in that jurisdiction. To find that “Goldilocks” position, make sure that you understand each provision in your lease and know why it’s there. That increases the odds that your tenants will, too. RULE #2. The lease provisions that will be enforced are those that appear to be specific to the lease negotiation, not conflicting fine print in a standard lease form. However, if that “meeting of the minds” is not obvious, there may be no way to enforce the lease. A lease agreement should reflect the relationship between the landlord and tenant, incorporating the landlord’s best property management policies and any special considerations for the particular tenant. It should not be the other way around; the lease agreement form should not dictate. This is a common problem when using unedited standard leases. Just because the lease form lacks a pet policy does not mean the landlord cannot allow pets. If there is no smoke-free addendum, that can be remedied. Get that language in order before you offer the lease to the tenant. Don’t let the tail wag the dog. A sure sign of this mistake is a final lease that has a half dozen or so add-on pages that cover standard provisions, or cross-outs with write-ins all over the margins. That can lead to missing pages, illegible entries and contradictions that are difficult to decipher. Keep what’s important up front and in the body of the lease agreement whenever possible to signal the relevance of those provisions. That aids interpretation if there is a dispute, but more importantly, it will help drive home the rules to the tenant, and prevent a dispute in the first place. RULE #3: Changes to the landlord tenant relationship that are negotiated after the lease is signed can have a major impact on the effectiveness of the lease, and may even terminate the landlord’s rights. One of the most common defenses to a rental lease agreement is a subsequent modification. Actions speak louder than words when it comes to changes in the landlord tenant relationship. Be careful what you promise a tenant, especially on the phone, if the policy deviates from what is stated in the lease. It’s typically better to formally amend the lease than to make a verbal agreement that encourages the tenant to disregard the lease. RULE #4: When push comes to shove, fine print matters. 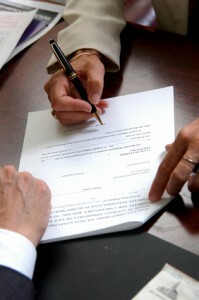 While the top paragraphs of the lease should be reserved for the most pressing provisions, the “boilerplate” or fine print provisions at the end steer a court when interpreting the lease and resolving lease disputes. While that language is tedious, it also must be precise in order to preserve a landlord’s rights. Don’t artificially shorten the lease by randomly omitting boiler plate provisions at the end. At the same time, don’t use the boilerplate from another state because those provisions might be illegal in a different jurisdiction.